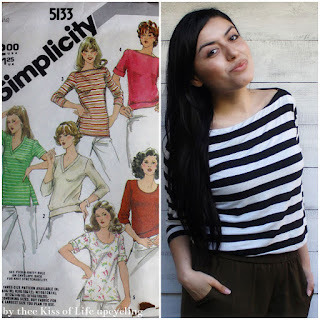 Simplicity 5133 sewing pattern (dated 1981) is definitely still relevant today and a real time saver as most, if not all, sewing patterns are. I mean that's why we use them right? Take the guesswork out of it. This particular pattern is especially time saving...it has that as it's tag line. Time Saver STREEETCH Knit! A+ typography on that, love it. I bought this remnant piece of striped stretch knit fabric from Joann and chose view 3 for it. It was a small piece so it wasn't going to be enough for the whole top. I'm pretty use to piecing things together, it wasn't a big issue. I used pieces of black stretch knit materials I had saved leftover from altered clothing (I think the majority of it was from a maxi dress made short). It worked out nicely and helped the top to not look borderline pirate / classic convict costume. I think this neckline really goes with stripes and can see why it was chosen for the sample sketch on the envelope. It's hard to see the seams but the back was three black panels and then the vertical striped panel on the end. Such a comfy top. If you come across this pattern, give it a try, you have five different style options to choose from.